And on the third day there was rest. Well…kind of. 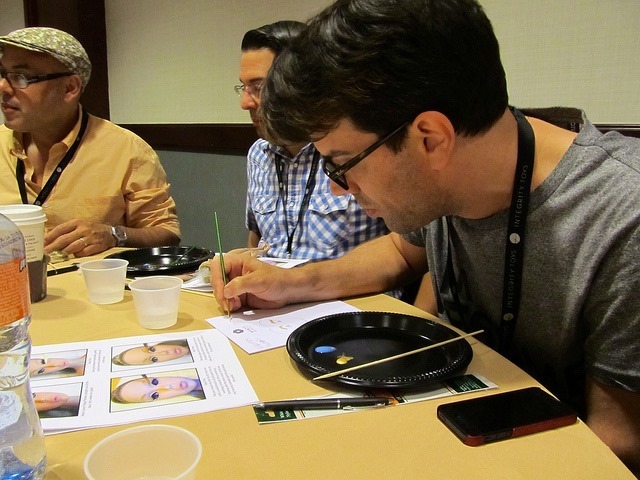 The hectic daily pattern that is convention slowed down on Saturday to basically two events. 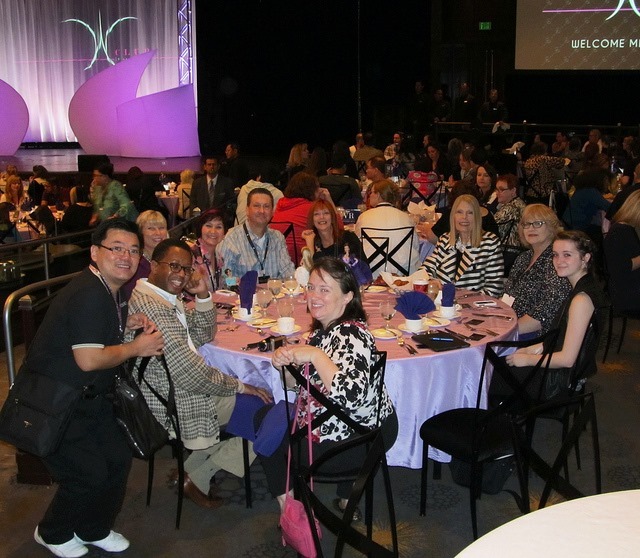 The WClub luncheon and the final dinner. I managed to get myself out of bed early enough to finish up the blog posts for the previous day and then all my good intentions of being on top of blogging went out the window. I am now home and finishing up LOL! 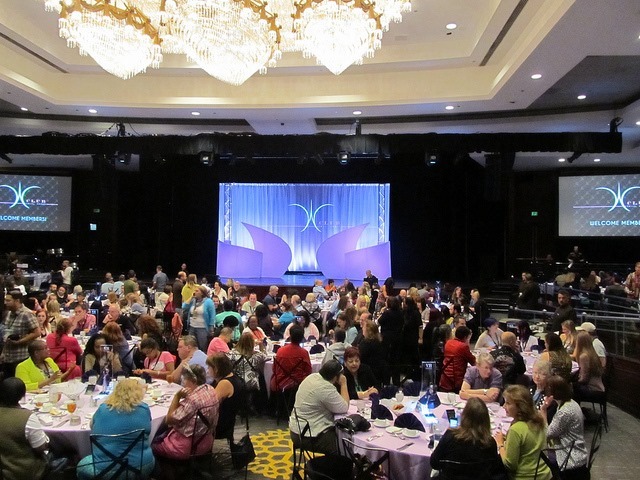 The WClub luncheon is an event that you sign up for separately and have to be a member of the WClub for. 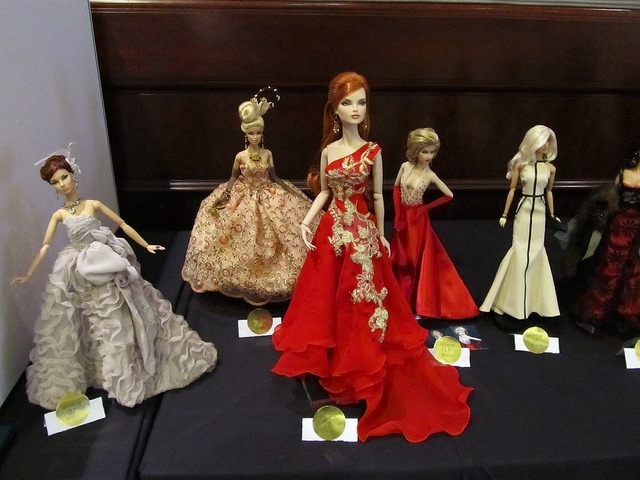 This year, it was announced that it would be a Victoire Roux event. In years past it has been a FR2 event. For this event, it is a sit wherever you want. Our table of 10 quickly filled up with some great people that I was not able to see at some of the other events. The centerpiece was STUNNING! 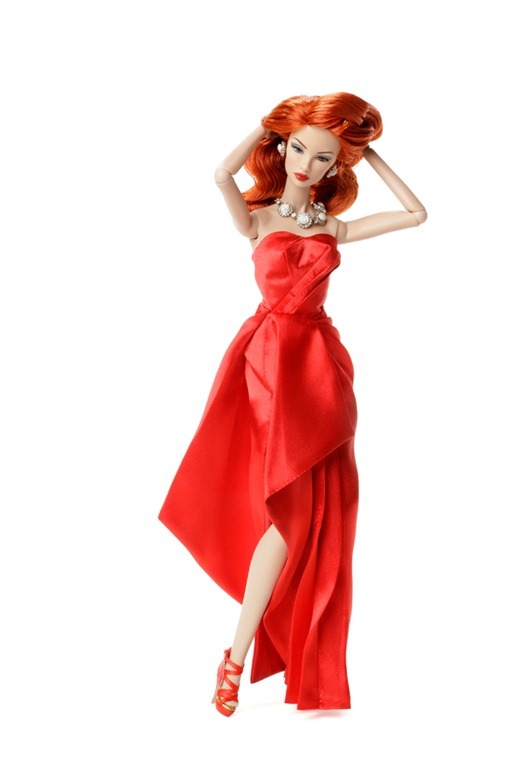 And…even better… we all had a chance to purchase her! 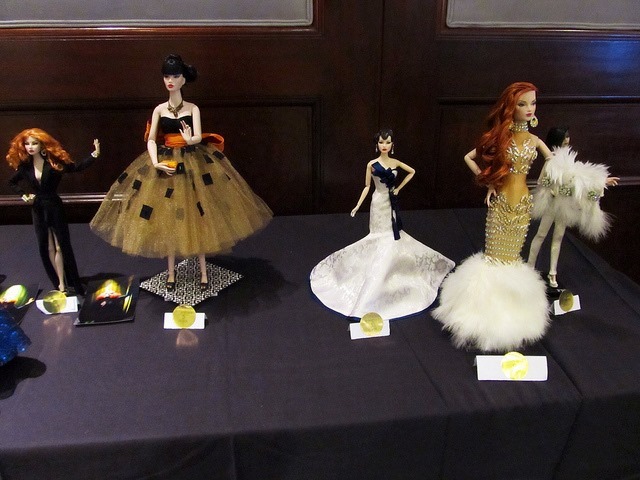 Photo source: Integrity Toys, Inc.
We also received a Victoire outfit as a gift with our meal. Chris Stoeckel talked about his love for 1950’s fashion and how it inspired his designs for Victoire. He also shared a sneak peak photo of the next Victoire coming down the pipe. It says IT Direct so get ready for the possibility of a lottery people. Once the luncheon was over, it was time to go upstairs, rest and attempt to start boxing up the insane amount of loot accumulating from this convention. Integrity Toys really spoiled us this time around. 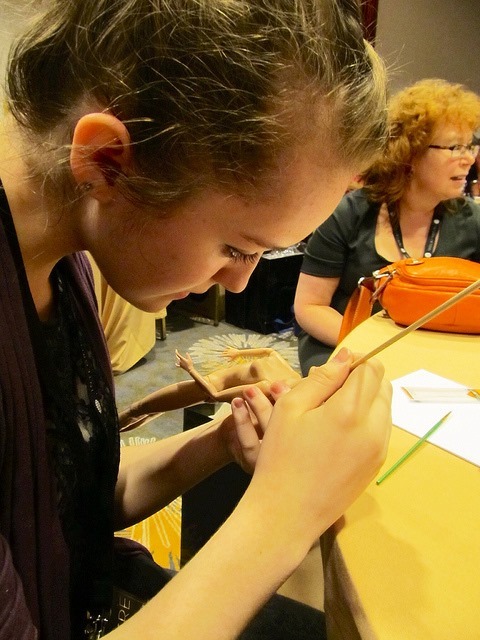 By this point in the convention many conventioneers realize “ Hey wait….we get a convention doll too!!”. Somehow, I always get to Saturday afternoon and I realize that the big reveal is yet to come LOL! 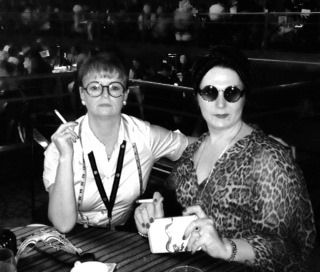 It ALWAYS sneaks up on me then I spend the afternoon hours thinking “ I wonder who she will be?” We were so overloaded with amazing swag at this point that anything was going to be complete gravy on a plate of steak, lobster and chocolate decadence. We walked into the ball room and were hit with a very edgy Jason Wu designed dress on a beautiful Vanessa. This one was a straight of the runway design by Jason. 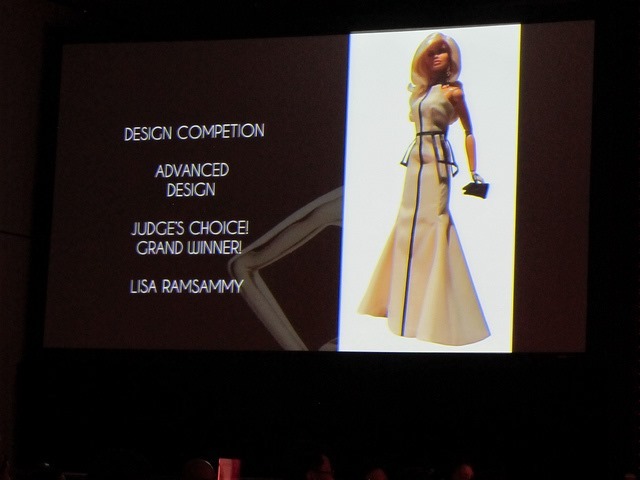 The competition winners were announced and the winner of the Advanced Design competition will have their design produced! Congrats Lisa Ramsammy!! 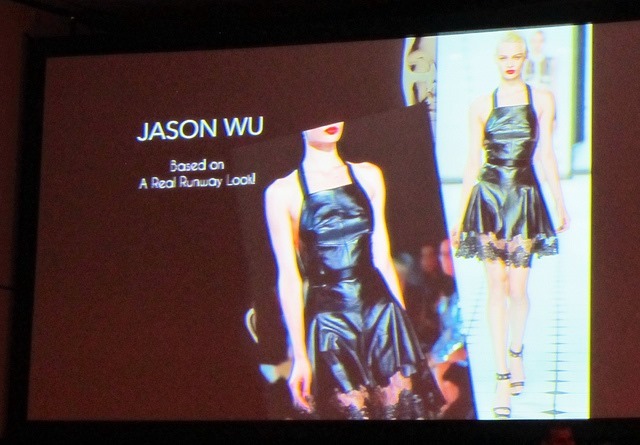 Jason Wu also made a special call out to my fellow blogger Shuga Shug . 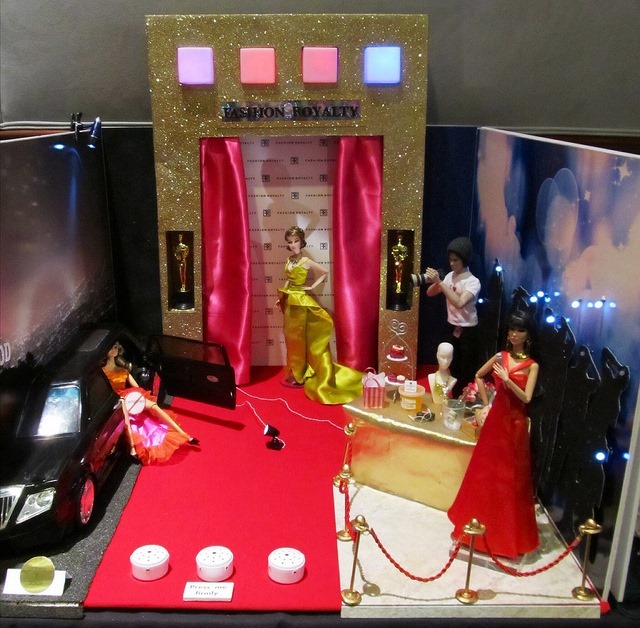 It was very deserving recognition for an amazing and inspirational doll blog. Shug, you rock it girlfriend…every post and every picture are an inspiration and I thank you. 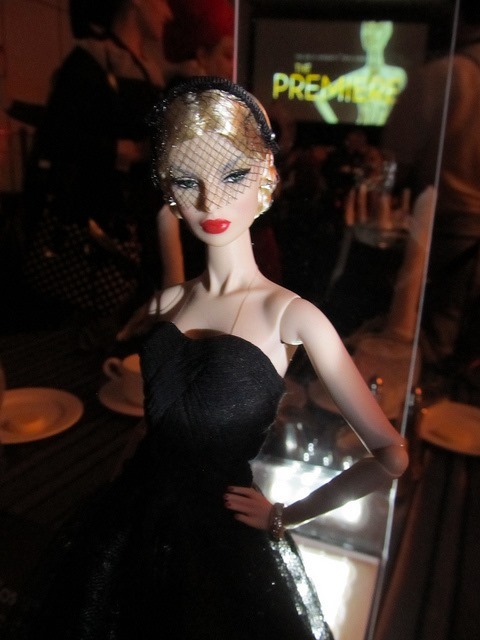 Finally, the big moment of the evening had come and the convention doll was revealed. 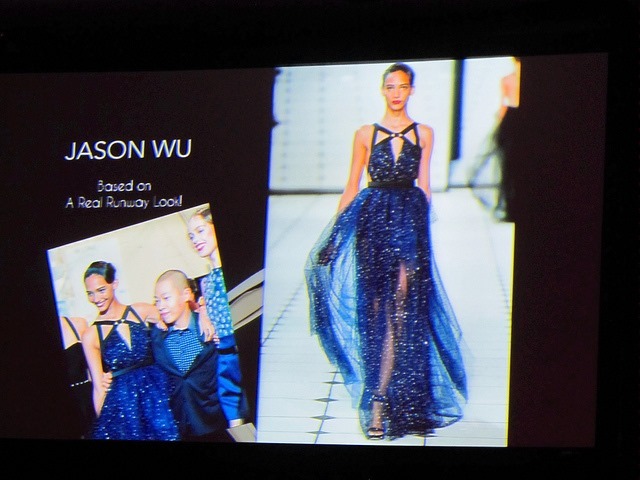 It was another straight off the runway gown by Jason Wu and apparently a particular favorite of Jason’s. Holy Shitake mushrooms people!!! Now THAT’S a convention doll. We filed out of the ballroom happy little campers with our loot and wonderful convention memories. 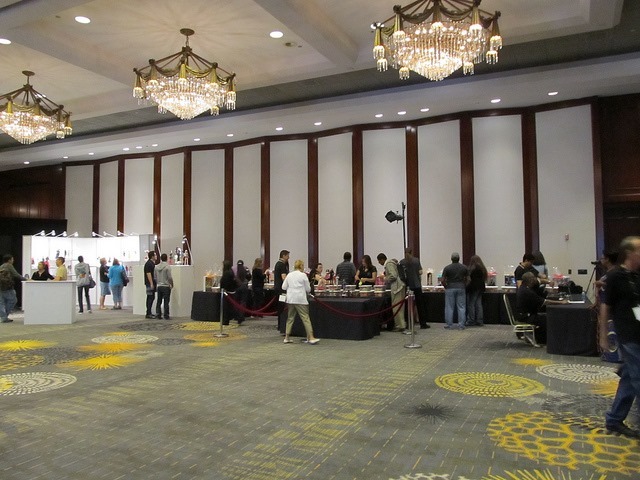 The real work began upon returning to our rooms….how the heck were we going to get all this convention swag home??!!! Well put the blame on Mame honey!! If you love Rita Hayworth, you will love this one. This is the centerpiece that greeted us upon entering the ballroom for Day two’s dinner event. 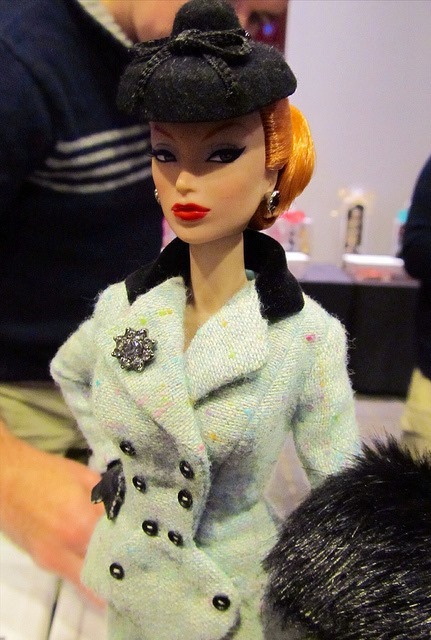 And if a visit from Rita Hayworth wasn’t enough, all the conventioneers were gifted with this lovely lady. The evening wrapped up with a fairly humorous and at times groan worthy game of Family Fued in which two teams(picked at random from the audience) battled for points while answering Fashion Royalty questions. 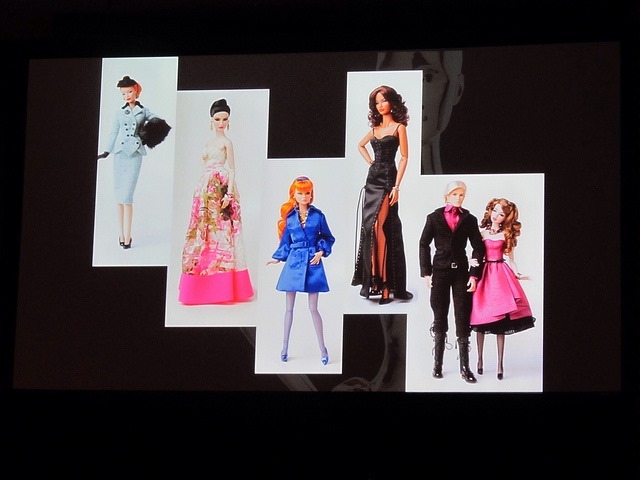 I learned that I can’t remember any names from previous years collections and am not able to name more that two convention dolls. Scary. I spent the afternoon looking at amazing raffle items competition entries. There are so many creative and talented collectors at this convention. 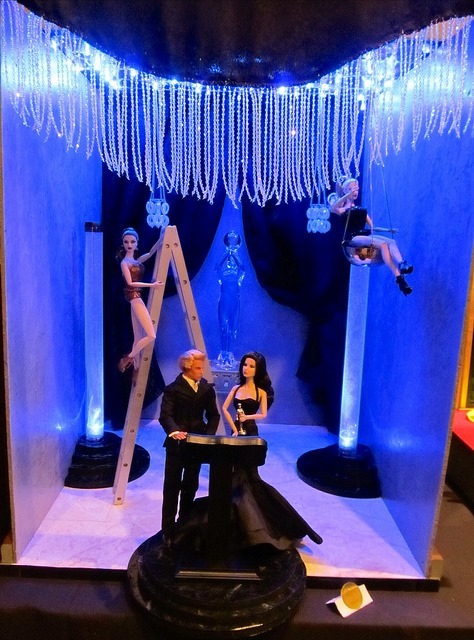 Where all my raffle tickets went….. An amazing OOAK Victoire by Chris Stoekel. My daughter and I also took an informative and hands on workshop with Matt Sutton where we all learned how to repaint Poppy’s face. Many of us ( myself included) decided to just practice on paper instead of the doll. I had the pleasure of sitting next to the witty and talented John P. in this class. 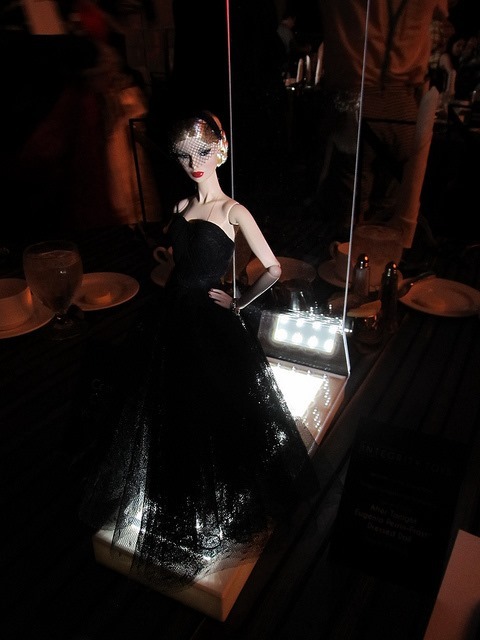 When the workshop was over, it was time to get ready for dinner and another fabulous centerpiece doll to drool over…… Day Two, Part III coming up shortly. 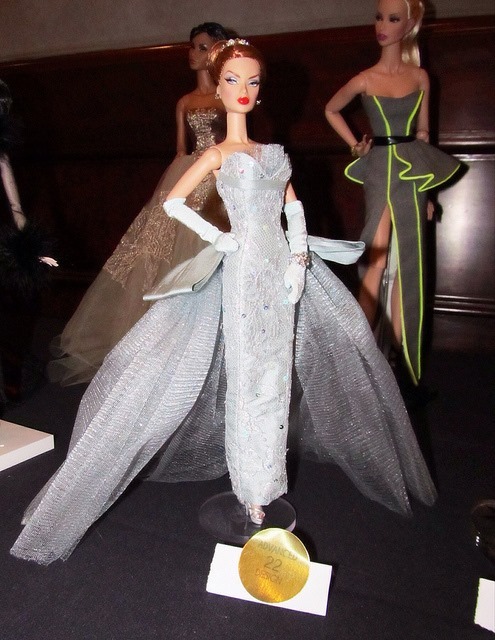 For many of us who collect Barbie and Fashion Royalty, Poppy Parker is perhaps the perfect in-between road between the two. 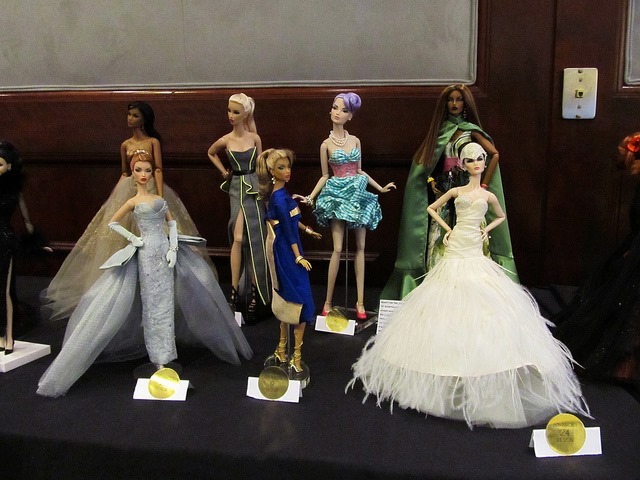 Many Barbie collectors have come into Fashion Royalty collecting through Poppy Parker so it can come as no surprise that the Poppy Parker luncheon is a highly anticipated event. We expected a stunning centerpiece and boy oh boy did Integrity deliver. 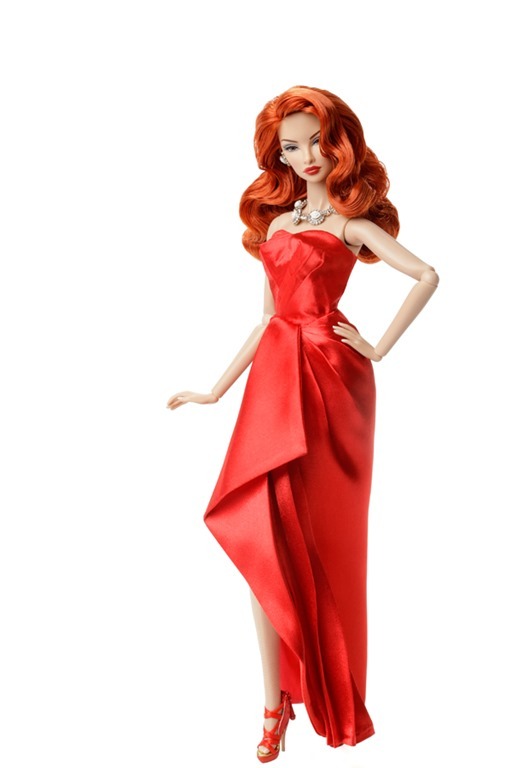 After a somewhat eclectic and interesting buffet lunch, Integrity Toys went above and beyond by gifting everyone with an absolutely stunning Poppy Parker doll. Thank you David Buttry and Integrity Toys!!!! 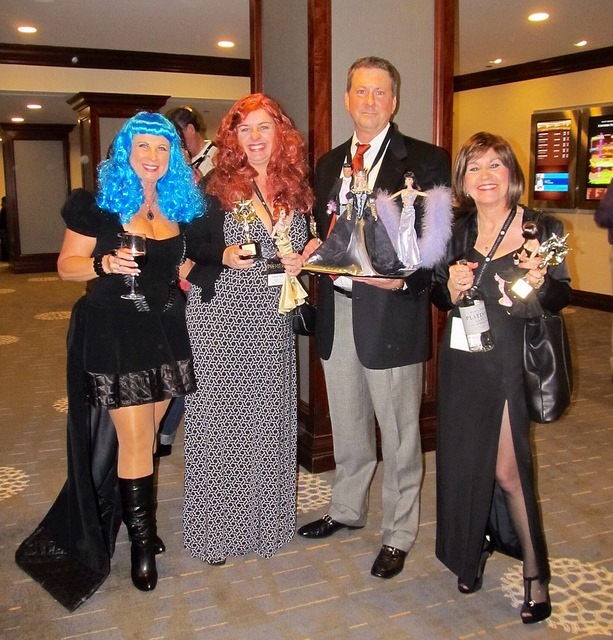 The first night of the convention fell on Halloween night this year so of course there had to be a Halloween party. 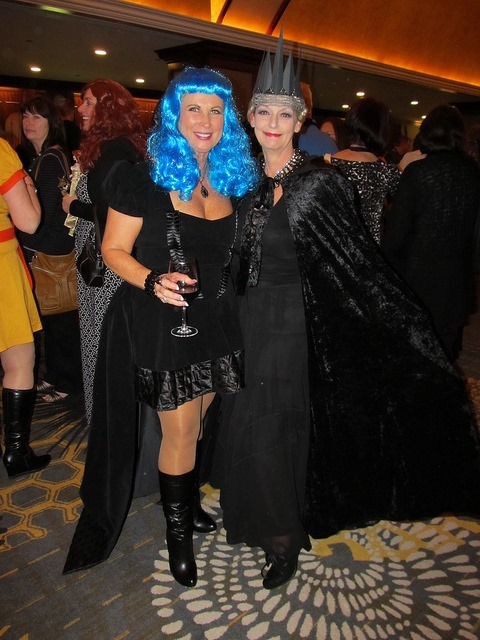 Many people dressed up for this…including myself and my daughter. 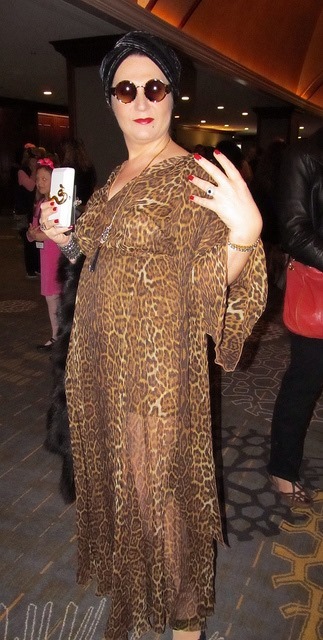 And the amazing Norma Desmond done by Rebecca V.
It was interesting because Edith Head designed the costumes for Sunset Boulevard so we decided to do a 1940’s style picture together and I LOVE IT!! A HUGE “Thank You!” to Bev B. for taking this photo and adding the b/w filter. 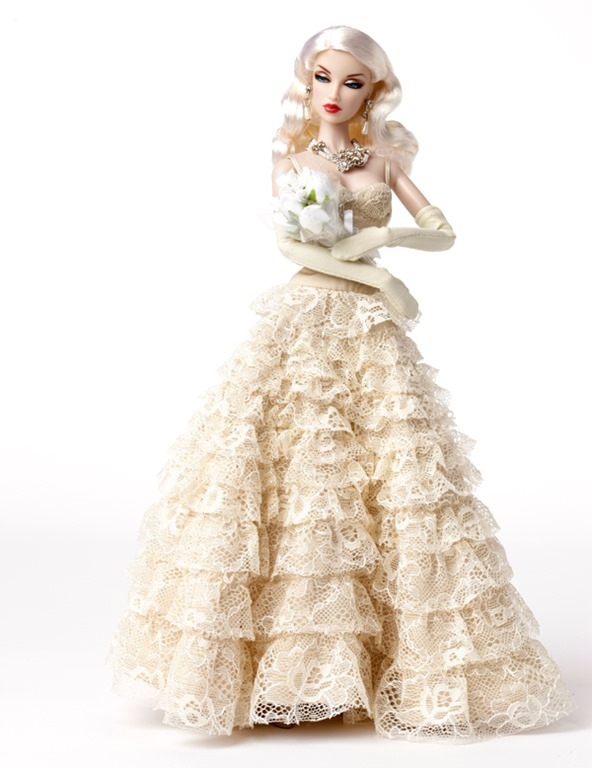 The centerpiece doll for the evening was a beautiful Eugenia! 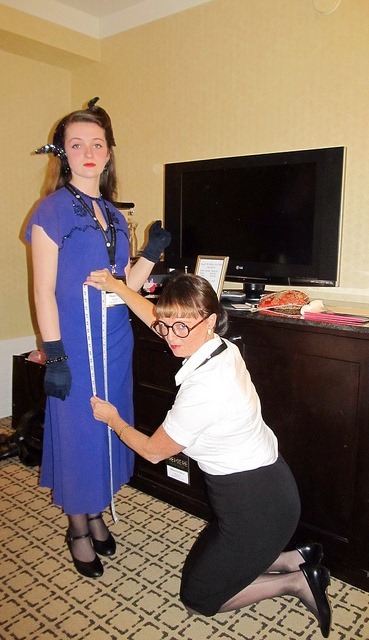 After dinner, we all received this beautiful Agnes….you should have heard the squeals of delight in the ballroom. Day Two coverage coming up in a bit. I hope to catch up today. 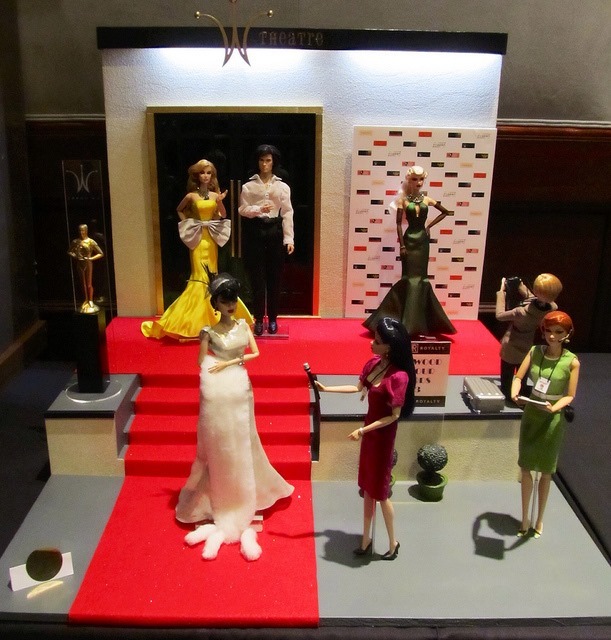 2013 will be the 10th official convention for Integrity Toys and it looks like it will be a big one. Am I going?? OHHHHHH YEAH!!!!! !